UPDATE: At Dot Earth,Andy Revkin has collected a great set of expert perspectives on this event. UPDATE #2: Subsequent to this post Gleick has added a new parenthetical to his post, that says the opposite of his first paragraph: "More extreme and violent climate is a direct consequence of human-caused climate change (whether or not we can determine if these particular tornado outbreaks were caused or worsened by climate change)." 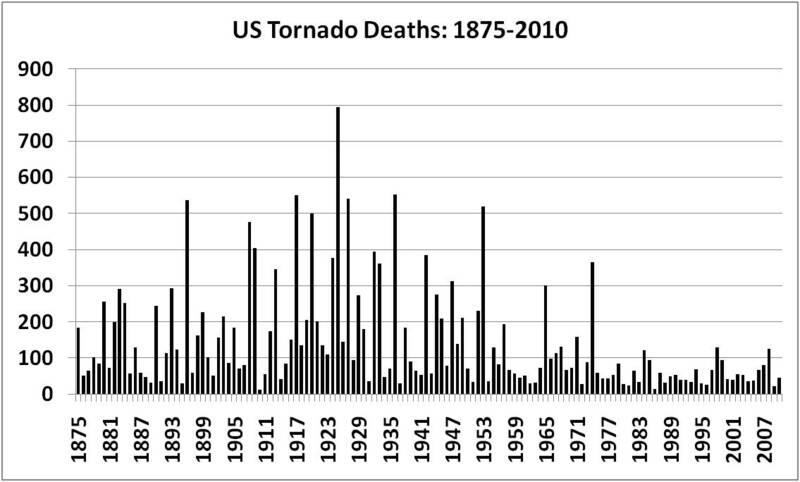 Violent tornadoes throughout the southeastern U.S. must be a front-page reminder that no matter how successful climate deniers are in confusing the public or delaying action on climate change in Congress or globally, the science is clear: Our climate is worsening. . . In the climate community, we call this "loading the dice." Rolling loaded dice weighted toward more extreme and energetic weather means more death and destruction. 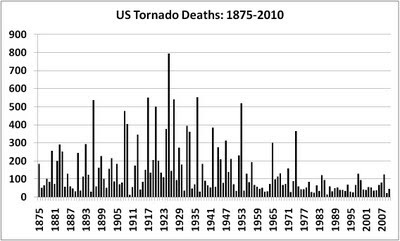 You can see in the graph above that there is no upwards trend in US tornado deaths, 1940-2010 (PDF). This year's very active season and tragic loss of life won't alter that conclusion. Actually there is a sharp downwards trend during a period when US population grew a great deal (consider this graph from Harold Brooks for a longer term perspective UPDATE: See below for this graph through 2010). There is obviously no evidence of "more death and destruction." On the lack of trends in destruction see this paper. What's the risk of another super-outbreak like April 3-4, 1974? 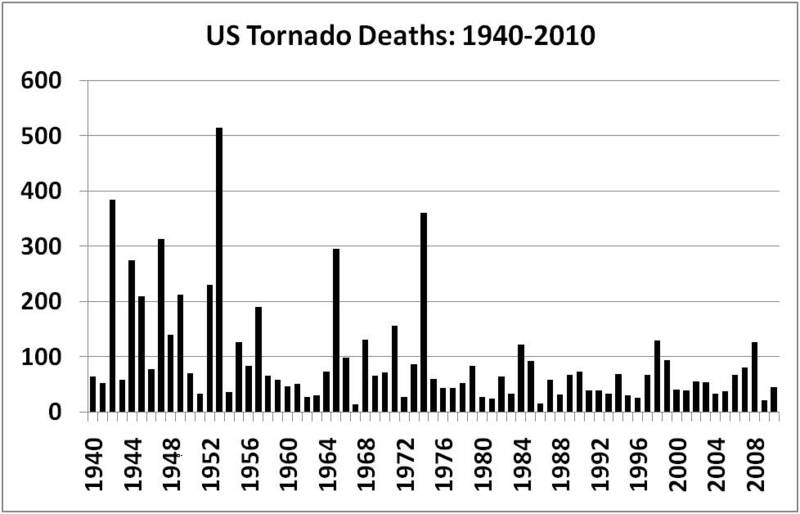 It's rare; but we don't know how rare, because an outbreak like that has only happened once since tornado records have been kept. 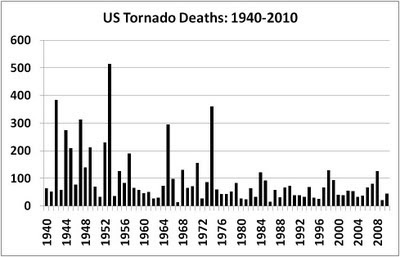 There is no way to know if the odds are one in every 50 years, 10 years or 1,000 years, since we just do not have the long climatology of reasonably accurate tornado numbers to use. So the bigger the outbreaks, the less we can reliably judge their potential to recur. Climate deniers who have stymied action in Congress and confused the public -- like the tobacco industry did before them -- need to be held accountable for their systematic misrepresentation of the science, their misuse and falsification of data, and their trickery. 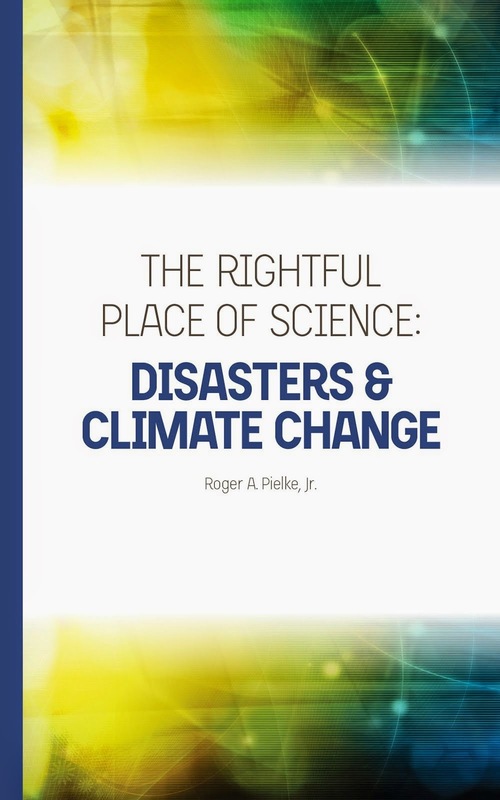 While the public may not fully understand the difference between climate and weather, or understand how the world could be warming while it's cold outside, most well-known climate deniers fully understand these distinctions -- they just choose to ignore them in order to make false arguments to and score points with the public and gullible policymakers. Cherry-picking selected data that supports a particular point (i.e., it's cold today), while hiding or ignoring more data that points in exactly the opposite direction (i.e., global average temperatures are rising), is bad science and it leads to bad policy. Just last week Glenn Beck pointed to a snowstorm in Minneapolis as proof that global warming isn't happening. He knows better, but his audience may not. A Decrease in Floods Around the World? The FA Work Permit: A Positive or Negative? What Prompted the Decline of Oil Power?